Bring the water to the boil, add the salt and rice mix, simmer (uncovered) over a low heat for approx. 10 mins., cover and leave to fluff up on the switched-off hob for approx. 5 mins., remove the pan from the heat. Thinly slice the onions, coarsely grate the carrots and press the garlic. Finely chop the mint, crumble the feta. Briefly toast the cumin and coriander in a non-stick frying pan without any oil. Add the oil, onions and garlic, sauté over a low heat for approx. 10 mins. Add the carrots and spinach, cook for approx. 5 mins., season. Stir in the rice mix, mint and feta. Leave the filling to cool. Melt the butter. Unfold the pastry sheets. Place 4 sheets next to each other on the work surface, overlapping by approx. 10 cm. Brush the pastry sheets with butter. Lay the remaining pastry sheets on top, brush with butter. Spread the vegetable filling lengthwise on the pastry sheets, leaving approx. 5 cm free at the ends. Fold in the ends, roll up into a strudel, twist to create a spiral, place on a baking tray lined with baking paper. Brush the börek with a little butter, sprinkle with sesame seeds. Mix the remainder of the butter with the mint and set aside. To bake Approx. 35 mins. in the centre of an oven preheated to 200°C. 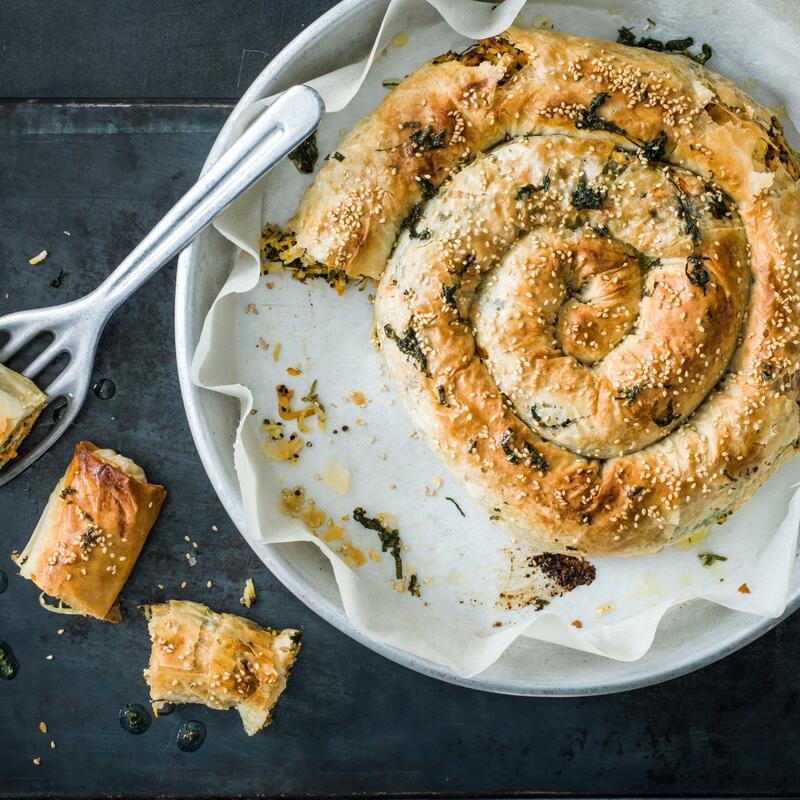 Remove from the oven, drizzle the mint butter over the börek, serve hot.